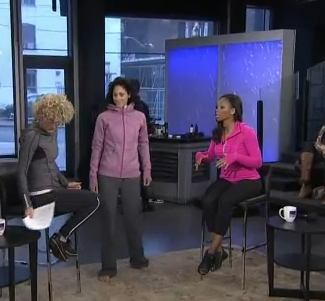 If you are Canadian you probably caught this episode of CityLine featuring Lululemon this morning. If not you can click <here> to watch the video. I think there are a few items in this video that haven’t hit stores yet such as the Paris Pink/Black reversible Wunder Under Pants (Paris Pink is rumored to be making a reappearance in February), The Run: Back On Track Long Sleeve in Heathered Grey (Heathered Silver Spoon maybe?) and the Scuba Hoodie towards the end. The scuba looks mauvy with a paris pink zipper contrast. It’s also really great to see the Flash Define Jacket in a more real setting. I really loved seeing all of these items styled the way they were. Tracy looks fantastic in that Paris Pink pullover, doesn’t she? "Camo Cool Racerback and Camo No Limit Tank"